We had originally planned on visiting these falls, and then visit St Columba Falls afterwords. We found the narrow turn-off road towards the falls, which headed steeply downhill, and soon reached a bridge. At this stage everything seemed fine, but as we went across the bridge, I noticed an official-looking sign stuck on a pole. Wondering what this was about, I got out of the car to have a look. The sign read: “RALPH FALLS CLOSED- Recent storm damage has resulted in severe degradation of the Ralph Falls track. The lookout has slumped and eroded, and requires assessment. 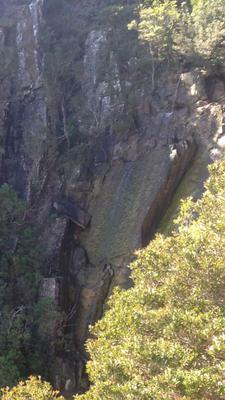 The walking track to the falls has severely eroded, exposing roots and rough rock and washed out steep track edges”. Disappointed, we headed back to St Columba Falls, where we got into a conversation with a tour bus driver. He told us that he had been to Ralph’s Falls before, and thought that it was visible from the road. This encouraged us to check it out. For the first few kilometres along the unsealed access road, all seemed well. However, as we pushed on, it deteriorated until it was really not suitable for our two-wheel-drive Suzuki. At one stage there was even what looked to be a deepish dry creek bed that ran across the road. Despite this, we pushed on, and did eventually end up reaching the parking lot for the falls, but only after spending 45 minutes driving 12 km. I later read online that the storm that was responsible for closing the track had also “seriously degraded” the road, which was probably why it was in such poor condition. Seeing as there was no sign of the falls from here (I’m not sure what the bus driver was talking about) we decided to embark on the walk to see how bad the track damage actually was. 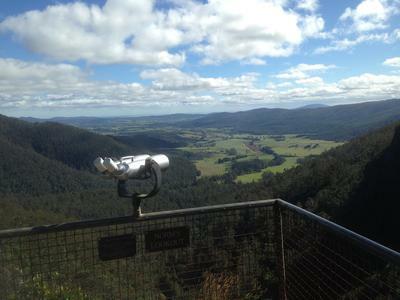 After a few minutes walking through pretty rainforest, we reached a track junction, which winded around the cliffs to the lookout. The side track was fenced off, and we didn’t want to take the risk of continuing, as it did look pretty legit. Nevertheless, we continued wandering around the cliff tops on the main trail to see if there was any other way that we could possibly see the falls. Soon we reached the top of the falls. We didn’t see an point in continuing from here, as there looked to be no safe way of viewing the falls. Dejected, we headed back, and soon reached the familiar track junction, where we saw a man, apparently waiting for someone. We exchanged greetings, and he told us that his wife knew this area well and had gone down the track to check it out. A minute or so later she returned, and told us that there was hardly anything wrong with the track at all. So we headed down the forbidden trail. I have to say, why they fenced it of is a mystery to me. It was a bit narrow around some edges and care was needed, but it still seemed pretty fine to me. As for the “slumped and eroded” lookout, there appeared to be absolutely nothing wrong with it at all. I have to wonder if the authorities even sent someone down to make this assessment of the lookout. 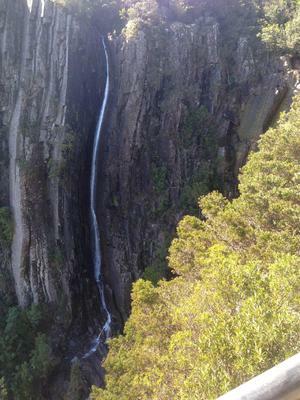 The falls themselves consisted of an impressively tall albeit thin 90 metre drop, along with a trickling companion waterfall that was also quite pretty in its own right. 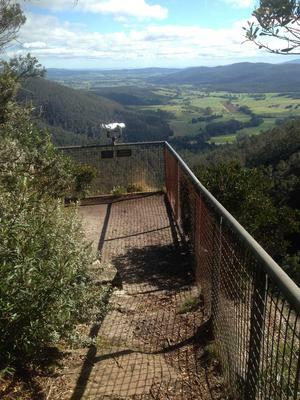 The side trail to the lookout actually commenced right at the top of the side fall. What further added to the beauty of the place was the amazing cliff formations around the falls, as well as the great view from the lookout.